He doesn’t have a name. He doesn’t have a clan. The humans who held him prisoner for 40 years have taken them away. He knew nothing but captivity until nearly a year ago, when he was released into the light. Now Tiger lives in the Austin Shiftertown, where he struggles to belong and searches for an identity. Entering unfamiliar territory when he was rescued from a Top Secret research facility deep inside Area 51, Tiger finds survival may be too far away for him to grasp as the military orders his execution. When Carly Randal finds herself stranded in more ways than one, the only person to rescue her is a man with tiger-striped hair and golden yellow eyes who has no name. Tiger knows full well who she is though. Carly will be his mate–he has no doubt. Now he has to convince her. 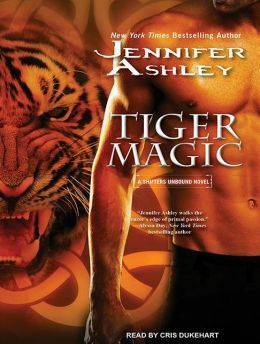 Author Jennifer Ashley has been known to deliver heart-pounding thrillers in her “Shifters Unbound Series.” The most recent installment “Tiger Magic” did not disappoint me. Reading Tiger’s story as it developed was truly one that kept the pages turning. Tiger was such an interesting character, very different from any of the other characters that have been introduced in the Shifters Unbound Series. Tiger doesn’t follow the rules, so to say, like others in characters in Shiftertown. Tiger follows his heart and lives for the protection of the Shiftertown cubs. “Tiger Magic” not only lived up to its predecessors, but leaves the reader thinking where will Ashley go with her next installment of the shifters unbound series. With every book the story changes, not so drastically, but enough to keep the story fresh.Even though this book is classified as a romance novel, I could easily see a guy getting into this book because of the strong male characters that dominate this novel, of course with their women at their side. “Tiger Magic” is filled with action, suspense and romance. It’s recommended reading for any adult.